4 from 8 = what a performance! After back to back 3/8s to start the year, yes I'll celebrate one more tip this week. 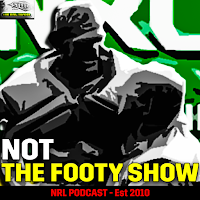 Alternatively there's a fresh NOT The Footy Show Podcast up. Townsville and no Nathan Cleary is good enough for me. Actually think Cronulla could spring an upset here... but am not tipping it. Well done Warriors - 3-0 is great and all but the Chooks are the tip. Newcastle bursting the St. George-Illawarra bubble would be great but don't think it happens this week. Titans gave up last week... Broncos didn't. Should respect the Tigers more but Parra... surely they are better than them even without Hayne and French?? This tip could change if I come to my senses.